You can download it to your PC, Mac, Smartphone or Tablet and use it offline. director, producer, actors, scenario, cinematographer, musical score, etc. "Red river" on a French magazine from the 60's. 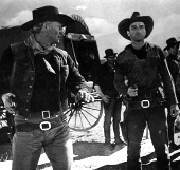 ° Westerns movies : a french aficionados site and a forum. A rarity ! "Western Film Series of the Sound Era", by Michael R. Pitts, McFarland. "Westerns" by Philip French, coll. Cinema One, S&W. "The Western, an illustrated guide" by Allen Eyles, Zwemmer et Barnes. "Westerns films" by novelist Brian Garfield, Da Capo Publications. "The Western", by Phil Hardy, coll. Aurum film Encyclopedia. "The BFI companion to the Western", by Edward Buscombe, Andre Deutsch/BFI. "A pictorial history of the Western film" by William K. Everson, Citadel Press. "Westerns", coll. Ian Allan Film Albums. "The Westerns, a picture quizz book", by John Cocchi, Dover Publications. "The cowboy's trail guide to Westerns", by David Matuzak. "The movie book of the Western", by Ian Cameron et Douglas Pye, Studio Vista Publication. "Westerns and the Trail of Tradition: A Year-by-Year History 1929-1962" by Barrie Hanfling, McFarland & Co Inc.
"Westerns and American Culture, 1930-1955" by R. Phillip Loy, McFarland & Co Inc.
"Westerns in a Changing America, 1955-2000", by R. Philip Loy, McFarland & Co Inc.
- "Cinema southwest, an illustrated guide to the movies and their locations", by John A. Murray, Northland publishing. "Les Indiens dans le western américain" by Mathieu Lacoue-Labarthe , Presses de l'Université Paris-Sorbonne (2013). "Dictionnaire du western" by Claude Aziza and Jean-Marie Tixier, Vendémiaire ed. (2015). "Sentences et proverbes de Westerns : recueil de citations", by Gérard Sallé, Thélès ed. (2010). "80 grands succès du western", by Pierre Tchernia & Jean-Claude Romer, Casterman ed. "Le western B, les années 1930-1939", by Didier Lodieu, Ysec ed. "L'espace filmique : sur la piste des diligences", by Odile Bächler, L'Harmattan ed. "Le western, quand la légende devient réalité", by Jean-Louis Leutrat, Gallimard ed. "Le western, une histoire parallèle des Etats-Unis", by William Bourton, PUF ed. "Histoire mondiale des westerns", by Eric Leguèbe, Rocher ed. "Splendeur du western", by Suzanne Liandrat-Guigues, Jean-Louis Leutrat, Rouge Profond ed. "Il était une fois… le western européen", by Jean-François Giré, Bazaar&Co ed. "Il était une fois en Italie... Les westerns de Sergio Leone", by Christopher Frayling, La Martinière ed. "Sergio Leone, le jeu de l'Ouest", by Oreste De Fornari, Gremese ed. "Le Western", by Gabriele Lucci (traduit de l'italien), coll. Guide des Arts, Hazan (2006). "Le Western", by Clélia Cohen, coll. "Les petites cahiers du Cinéma" (2006). "Le Western et ses mythes ", by Nicole Gotteri, Bernard Giovanangeli edition (2005). "Le Western", collective work, Tel coll., Gallimard. "Le Western" by Jean-Louis Lieutrat, Prisme coll., Armand Colin. Cinéma 71 magazine, n°154 : "10 ans de western"
"Western" magazine, printed since 1972. Star and producer in "Alamo"
my third site about the movies, this one dedicated to the film noir, thriller, detective or gangster film genres, etc. FilmNoir is also a subset of my CINEFAN database (in French and English). 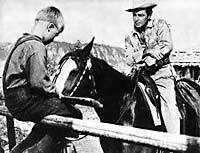 - Internet Movie Database: the famous IMDB, at least 140 000 films ; but you can't download the database nor use it and adapt it to your taste as you can with... "WESTERNS" or "CINEFAN"!!! - All Movie Guide: about as many films as in IMDB, but you can't downlaod the database and adapt it to your taste, make it yours, on your own PC, like with... but I seem to repeat myself !!! - The Movies on line, interesting ressources for the amateur. - CaHieR Du FiLMoGRaPHe , a personal site dedicated to filmographies. - about the Hollywood classics. Warning : this site is a private one. Photographs presented here come from my personal collection, or from uncontrolled sources. If some of them are used in an inappropriate manner, please tell me so that I can take the appropriate mesures.